Best World Series game of my lifetime (born in 1993)? Just may be as game 6 of the 2011 World Series was truly epic and it concluded in an amazing fashion as Cardinals third baseman David Freese hit the game winning home run in the bottom of the 11th off Rangers reliever Mark Lowe to give St. Louis a 10-9 win to send the series to a game 7, the first since 2002. Well the Rangers appeared to have it in the bag in the bottom of the ninth with closer Neftali Feliz on the hill up by two. 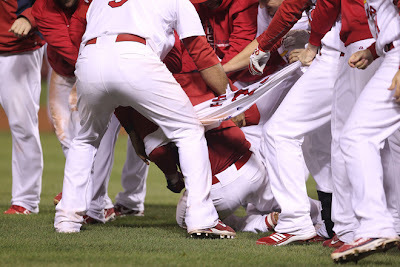 But with the Rangers a strike away from the title, Freese hit a second run triple, which was badly misplayed by right fielder Nelson Cruz, which tied this ballgame. Josh Hamilton then hit a two run homer in the top of the tenth to give Texas the 9-7 lead. 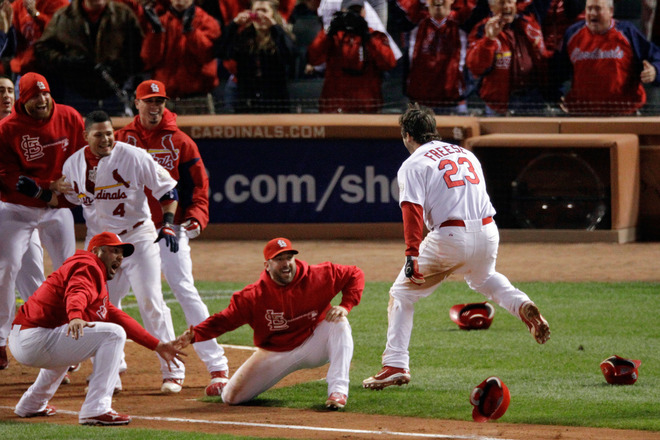 In the bottom of the 10th, Daniel Descalso scored on a groundout by Ryan Theriot and then Lance Berkman singled to center and scored Jon Jay to tie the game. 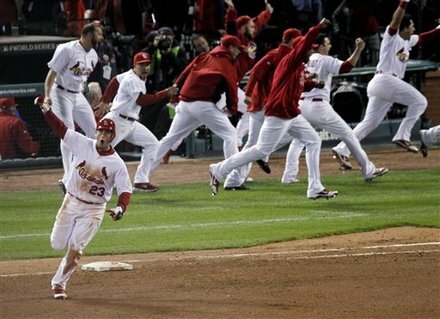 The Rangers got nothing in the top of the tenth and then Freese continued his heroics by getting St. Louis the win. As Joe Buck said, emulating his late father's legendary call when Kirby Puckett hit the game winning homer in game 6 of the 1991 World Series, "We'll see you tomorrow night." Game 7 will be on Fox Friday night at 8:05 and I have no idea who would not be watching. Continue reading to see it all happen. First, Freese ties the game.